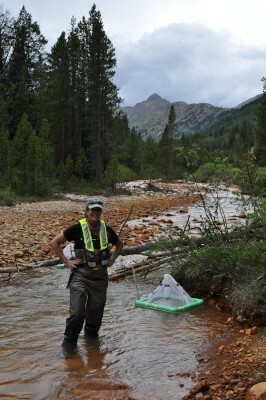 USGS scientist pauses during field work in a stream impacted by acidic runoff and metal contamination. Iron precipitates are visible on the stream's rocks. The mesh pyramid is an insect emergence trap. Photo Credit: Peter Leipzig-Scott, USGS. A riparian zone rich in terrestrial insects can provide an alternate food source for fish in metal-impacted watersheds. Streams and rivers around the world are effected by acidic runoff and metal contamination. This can occur through natural processes caused by the action of wind, water, and air reacting with previously buried minerals and metals present in streams and their watersheds as well as activities associated with historical and ongoing mining activities. The typical diet of many fish, including trout, is dominated by aquatic insects. Many aquatic insect species such as mayflies, stoneflies, and caddisflies are very sensitive to the pH and concentration of metals (for example, zinc, cadmium, and copper) of the streams they live in. As metal concentrations increase, the populations of aquatic insects can be diminished to the point that they may no longer be a reliable food source for fish. A recent study surveyed brook trout (Salvelinus fontinalis), brown trout (Salmo trutta), and cutthroat trout (Oncorhynchus clarkii) diets and the relative availabilities of aquatic and terrestrial insects in 16 streams across a gradient of metal concentrations in the Colorado Rocky Mountains. Aquatic insects declined as metal concentrations increased, whereas terrestrial insect inputs to streams remained relatively constant. The fish diets reflected these relative availabilities, consuming more terrestrial insects as concentrations of metals increased; however, trout were not present in the three streams with the highest concentrations of metals observed in this study, which is likely a consequence of the degree of contamination. These findings have important implications for resource managers trying to maintain productive fisheries. A healthy, thick zone of riparian vegetation with a high volume of canopy overhanging the stream can increase terrestrial insect inputs. By maintaining a healthy riparian zone, it may be possible to alleviate the stress of reduced food resources to fish in watersheds with metal contamination issues. This study was supported by the USGS Mendenhall Research Fellowship Program and Contaminant Biology Program. Kraus, J.M., Pomeranz, J.F., Todd, A.S., Walters, D.M., Schmidt, T.S., and Wanty, R.B., 2016, Aquatic pollution increases use of terrestrial prey subsidies by stream fish: Journal of Applied Ecology, v. 53, no. 1, p. 44-53, doi:10.1111/1365-2664.12543.